Turmeric (Cucuma Ionga) is an herb used in curries, including many foods from India and China. Turmeric contains the active substance curcumin. This is extracted, then used in many herbal treatments in Chinese herbal medicine and Ayurvedic medicine. It's used to treat ulcers, heartburn, and relieve arthritis pain and many other ailments. Curcumin is used as a powder, capsules, teas or liquid extracts (tinctures). A tincture is an herbal extract combined with an alcohol base. Researchers at the University of Texas Medical Branch at Galveston have found that turmeric blocks hormone activity that's responsible for the development of colorectal cancer. It's also being used to suppress growth activity in pancreatic and breast cancer cells. Turmeric causes cell death in tumor cells but leaves other cells untouched. This is important for many areas of cancer research. Turmeric is effective in treating cognitive deficits and neuroinflammation in neurodegenerative disorders such as Alzheimer's disease (AD), according to the National Institutes of Health. Curcumin, the active ingredient in turmeric tincture, reduces the chronic inflammation of nerve cells and reduces the oxidative damage that causes AD. Turmeric is one of the base ingredients in curries that are commonly consumed in India. The incidence of Alzheimer's disease in India is 4.4 times less than in the U.S., according to the National Institutes of Health. Turmeric tincture inhibits the onset of rheumatoid arthritis, according to Dr. Funk, endocrinologist, University of Arizona Health Sciences Center. Turmeric supplements contain the same mechanism of action as anti-arthritic pharmaceuticals. Dr. Funk discovered that it also might be used to prevent bone loss and osteoporosis. Turmeric tincture is used as an anti-inflammatory in both traditional and non-traditional medicine, but evidence from a study at the Department of Experimental Therapeutics at the University of Texas M.D. 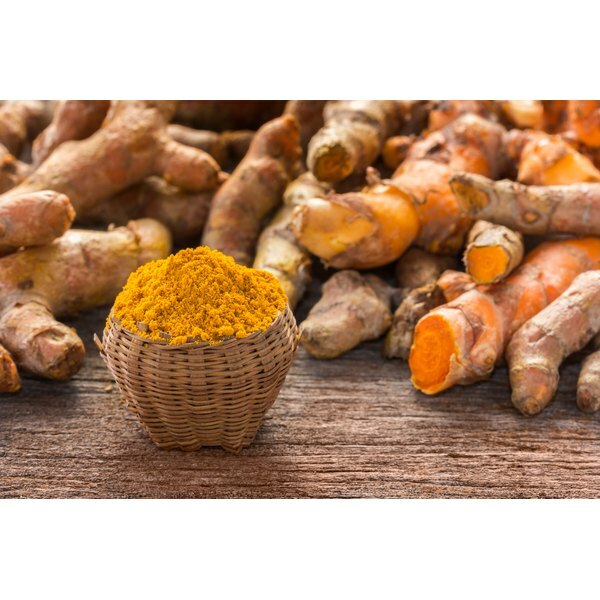 Anderson Cancer Center in Houston shows turmeric regulates numerous transcription factors that are linked to inflammation. Inflammation plays a major role in many chronic diseases, including heart disease and neurodegenerative disease. Turmeric curcumin has a potential role in the prevention and treatment of a variety of chronic diseases. Turmeric tincture is an extremely effective antioxidant that neutralizes free radicals in the body that can damage cell membranes, tamper with DNA and even cause cell death, according to the University of Maryland Medical Center. Turmeric tincture is used to improve digestion and many other digestive disorders. Using 15 to 30 drops in a cup of warm tea can help sooth an upset stomach or indigestion. The recommended daily dose is 15 to 30 drops four times per day for an adult, according to the University of Maryland Medical Center. In studies on animals by the Department of Biochemistry, Annamalai University, Annamalaingar, Tamil Nadu in India, turmeric was found to reduce the blood sugar levels significantly. What Are the Benefits of Grape Wine?